Mailgun offers pretty easy integration and 10'000 free emails a month. Plus the customer service is amazing. DigitalOcean can host a pretty cheap and comfortable cloud server. The registering process should take you right to the button. If it doesn't just go to the control panel and click on Add Domain. Enter a domain you own. Please note that you can use this one domain with many services. NOTE: I'm using "mailgun.domain.com" subdomain just to separate concerns. It's actually easier and more practical to just use your main "domain.com" instead. Log into DigitalOcean and select the Networking tab on the left. Select your mydomain.com (no need to create separate subdomain). Use the "Add record" button to add all the necessary information. the txt details may need to be in double quotes: "v=spf...". the v=spf part needs an @ in front, not your domain, as Mailgun instructs. 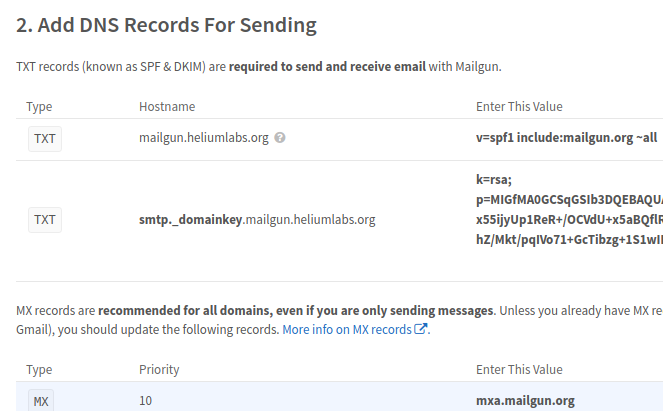 Mailgun domains use the extension .org! Usually this takes about 24 hours. If you're in a hurry you're welcome to go insane with the "Check DNS Records Now" button. Did your domain get verified? Feel free to ask questions in the comments.